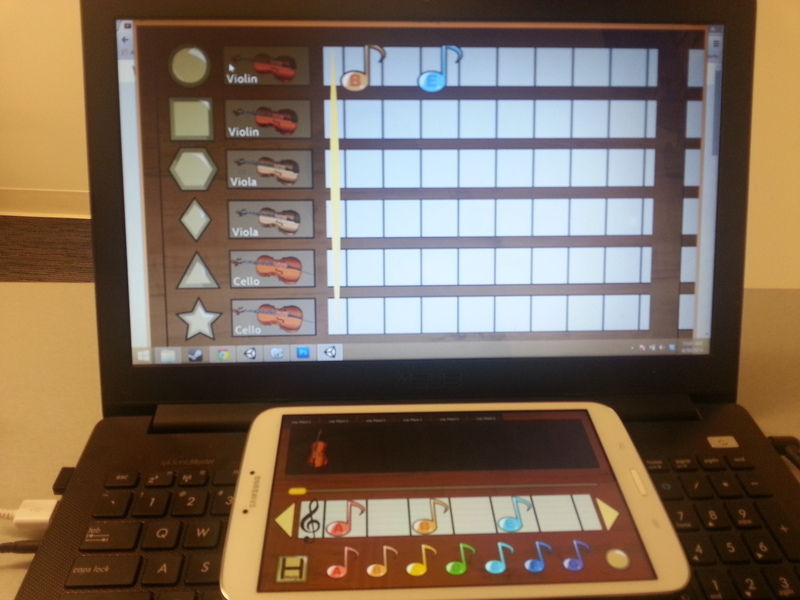 Harmony is a collaborative music making game where six players construct their own quick songs. The purpose of this educational game is to help engage people of all skill levels and ages in the music making process by providing them an simple and intuitive interface to build music. Each player is provided a tablet with the game that is networked to a central computer. This is an expanded prototype developed in collaboration with the Perot Museum of Nature and Science. Note: The following images are considered promotional. Even though the programming and networking works, some images are not musically accurate. 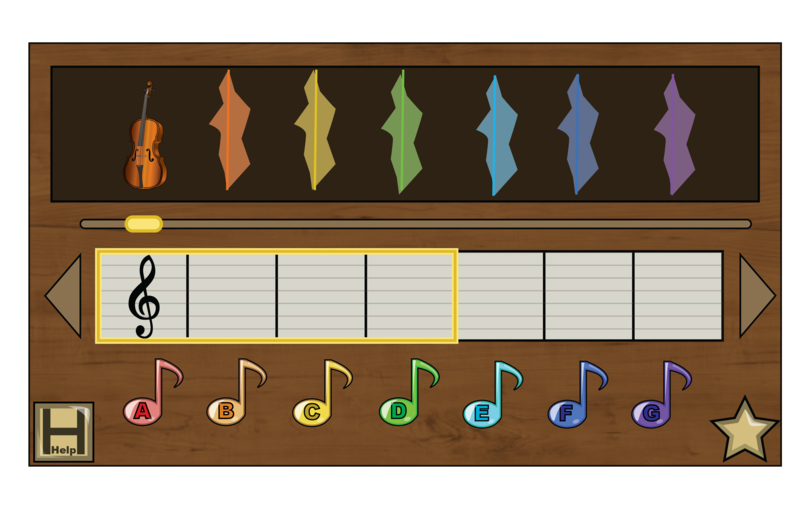 We’re currently working on that to get a more accurate depiction of musical notes! The tablet is a simple interface where players drag and drop notes onto a series of blank spaces. 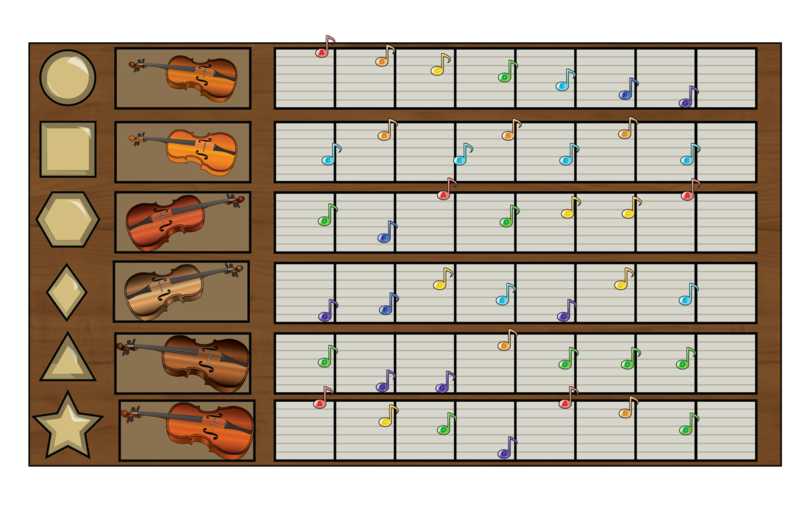 Players are able to scroll from side to side and see their own sequence of notes. Each note placed by a player is presented on the central hub screen where players can work together to construct harmonies and develop songs. Using simple color schemes in order to communicate notes, players can explore the sounds of harmony by color, realizing that the combination of different colors provide pleasant sounding melodies, while other colors create a small level of chaos. Considering the technical parts: The front-end of the project is built in Unity 3D. In it’s current state in May, the game is able to have six tablets connected to the central hub by a wireless network. The game connects to a program built in Puredata, a music development program. The Puredata program is a multi-instrument sequencer that provides realistic sounds for each instrument.